Shetland has been blessed with good fortune for the past 40 years. Thanks to the efforts of our far-sighted MP Jo Grimond in the 1970s, we were granted an Act of Parliament that paved the way for the SIC to negotiate a landmark deal with the oil industry. As a result Shetland has been able to invest hundreds of millions of pounds into improving life for everyone in this community. Why is Shetland the only community in Britain to have benefitted in this way? How is it that Norway has used North Sea oil to create an oil fund worth more than £500 billion, while Britain has ended up with a debt of more than £1.3 trillion? A debt that grows by more than £4,000 a second! This debt exists despite all the income from North Sea oil, and all the billions the UK Treasury has earned by selling off state assets, like the railways, electricity and water companies, British Telecom and even BP. So where has all that money gone? The UK government’s handling of Britain’s wealth makes Shetland Islands Council look like a model of prudence. Such gross mismanagement has left the country, in former Chancellor and Better Together leader Alistair Darling’s own words, “relying on Scotland’s oil revenues to underwrite its failure to balance the books”. This means that the UK cannot afford to lose Scotland. We believe Scotland cannot afford to stay in the UK. For the past 35 years since the election of Margaret Thatcher, government policy has allowed a small section of society to become fabulously wealthy, while the rest of the country pays the price with massive public spending cuts. They have made the UK one of the most unequal developed countries in the world. Those public spending cuts almost lost us our coastguard control room in Lerwick at a time when there has never been so much shipping activity around these isles. It was only saved by having our local MP in the Cabinet at Westminster. Had Alistair Carmichael not been there, we would also still be saddled with a £40 million housing debt the UK government promised to pay more than 30 years ago. We cannot rely on past good fortune. We need protection from such appalling bad management. Shetland News believes the best protection comes from a Yes vote on Thursday. The No campaign argues that we put our future at risk by such boldness, however their scare stories have been shown to have little substance. If Scotland votes Yes, there will be an outbreak of common sense over issues such as currency and membership of the EU as both sides seek to maintain stability in a world of interdependence and global financial markets. For Shetland a Yes vote will bring us a permanent minister for the Scottish islands in the Cabinet to speak up for and protect our interests inside government – the most important achievement of the Our Islands, Our Future campaign. In comparison Westminster is offering a temporary desk in the Scottish Office – the days of Jo Grimond are long gone! 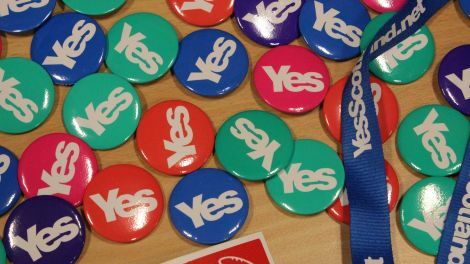 A Yes vote will also bring a new constitution for Scotland, in which the Scottish government has promised to devolve more power to local communities. Cynics point to the centralisation of the police and fire service to show the SNP do not mean this, but a Yes vote will put us in a stronger position to make sure they stick to this promise. In contrast, a No vote will mean more public spending cuts that will inevitably lead to greater centralisation, as that is the cheapest way of running things. No one doubts that Scotland is a prosperous nation able to stand on its own two feet. With independence it will be able to do just that. Instead of seeing our wealth squandered on outdated institutions such as the House of Lords and nuclear weapons we do not need and cannot afford, we can invest it in a modern, efficient system of government that reflects the values of a nation more interested in sharing wealth and creating a more equal society than using it to further enrich the wealthy and powerful. Fishermen and crofters who fear they will be worse off outside the UK, will instead have a stronger voice in Holyrood, which in turn will be in a better position to argue for a fairer deal from Europe. The most exciting thing about the past two years has been the way it has energised a huge number of people, especially young people, with a sense of hope for the future. Never has the population been so well informed, and what has been most interesting is that the more informed people become, the more likely they are to vote Yes. It is true that independence will not be an easy option: there will inevitably be considerable upheaval in the short term. It will take hard work, courage and determination to make it succeed. But this is an opportunity to rise to that challenge and it will not be repeated for a generation if we vote No. Yet if Scotland votes Yes and does rise to that challenge, perhaps we can inspire others to take hold of their destiny and show that another way is possible. Shetland News is run by a Scotsman, an Englishman and a German – we are not nationalists and we do not vote for the SNP. However we will vote Yes to bring our government closer to home and to give us more influence over the decisions it takes.